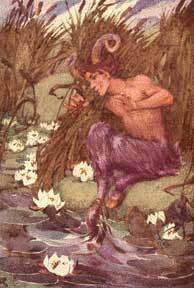 Pan, the god of woods and fields, of flocks and shepherds, dwelt in grottos, wandered on the mountains and in valleys, and amused himself with the chase or in leading the dances of the nymphs. He was fond of music, and as we have seen, the inventor of the syrinx, or shepherd's pipe, which he himself played in a masterly manner. Pan, like other gods who dwelt in forests, was dreaded by those whose occupations caused them to pass through the woods by night, for the gloom and loneliness of such scenes dispose the mind to superstitious fears. Hence sudden fright without any visible cause was ascribed to Pan, and called a Panic terror. As the name of the god signifies all, Pan came to be considered a symbol of the universe and personification of Nature; and later still to be regarded as a representation of all the gods of paganism itself.